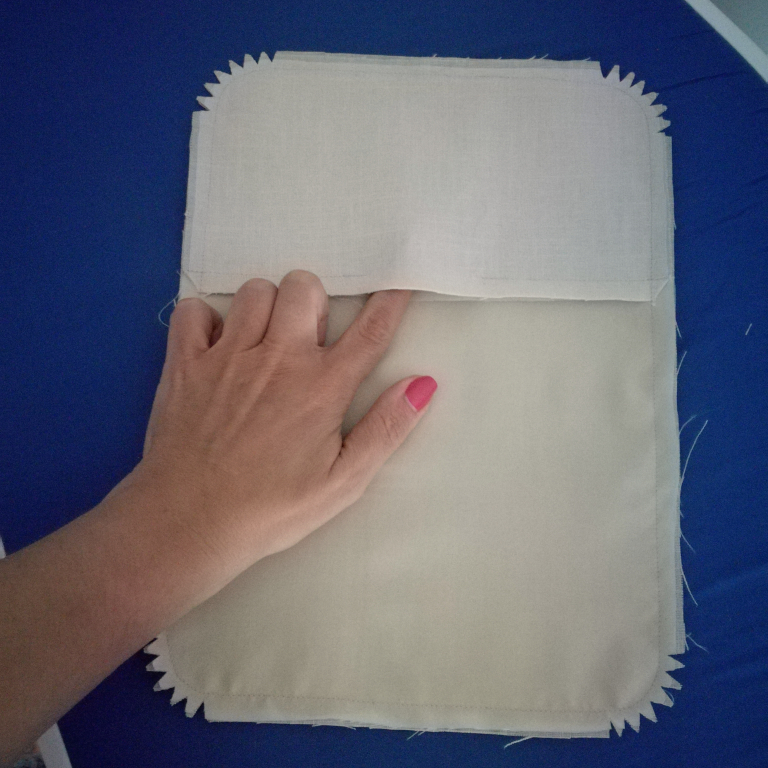 EN: Miss Fisher's driving coat sports patch pockets with flaps and I remembered to make the flaps as part of the pocket itself instead of making them as a separate detail and stitching them above the pockets. 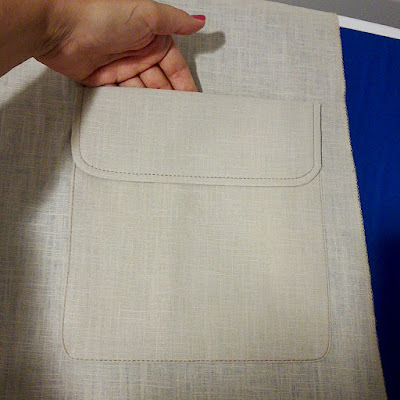 To make pockets with integrated pocket flaps the pocket pattern piece should be extended with the flap shape on top. Then there are two ways: if you are making it unlined, just cut a piece an inch longer than the intended flap vertical length, interface it and finish its straight edge with a serger, zigzag or pinking shears; then stitch it on top of the patch pocket with integrated flap, right sides facing; grade and notch the SAs on curves and turn it; then press the flap down (the interfaced section will be the public side of the flap) and press the remaining seam allowances in to the wrong side around the pocket bag outline, with the help of a cardboard template, for example. 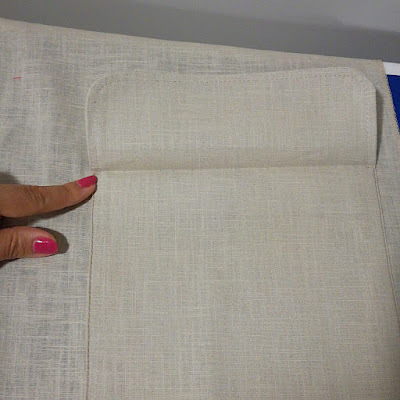 The pocket is ready to be top-stitched to the garment. 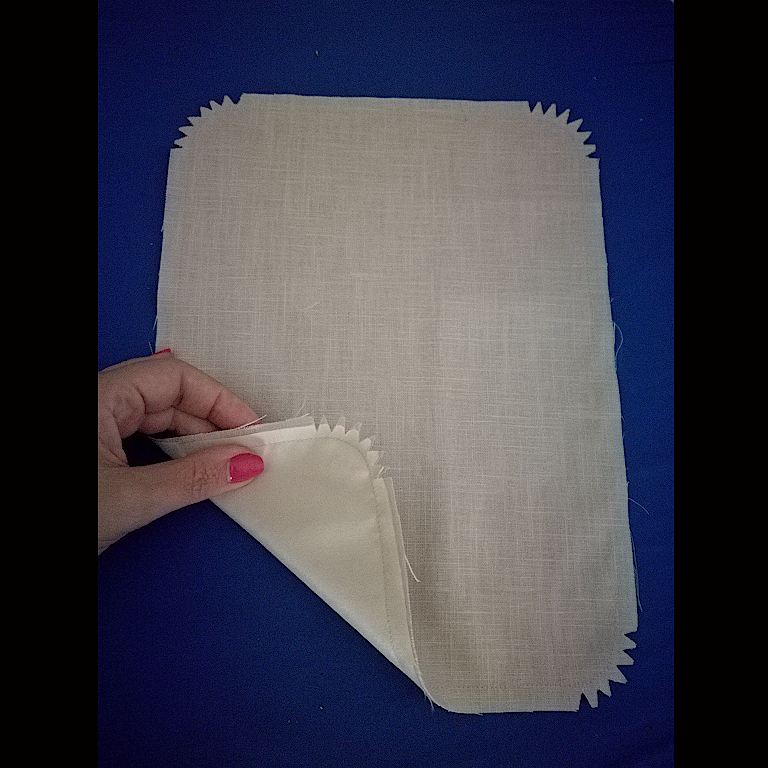 I made my pockets lined which means I not only cut the interfaced portion extending the length of the decorative flap but also lining which is stitched together with the interfaced piece (seam allowances pressed towards the lining), covering the entire patch area. I left a small section open on the seam that joins the lining with the interfaced piece, so I could turn the pocket to the right side once it was all assembled; TIP: You can use the pocket pattern piece without seam allowances as a template for stitching around the pocket outline with precision; you can also use freezer paper as a template and temporarily iron it to the fabric to serve as a stitching guide. PT: O casaco de detetive da Miss Fisher tem bolsos de chapa com paletas, e para simplificar resolvi confecionar o bolso com a paleta já integrada, ficando assim meramente decorativa, em vez de confecionar a paleta à parte e cosê-la depois por cima da entrada do bolso de chapa. 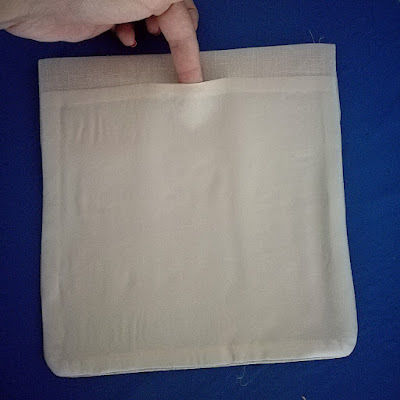 Para fazer os bolsos de chapa com a paleta integrada, o molde do bolso deve incluir já a paleta no topo. Depois há duas formas: com forro ou sem forro. Para fazer a versão sem forro basta cortar uma secção extra do molde, mais larga do que a paleta uns 2.5cm e entretelar essa peça. A beira de baixo deve ser acabada com a corta-e-cose, ponto ziguezague ou tesouras de cortar em ziguezague, e depois essa peça cose-se à parte superior do bolso/paleta, direito contra direito. Depois de dar os cortes nas partes arredondadas, vira-se para o direito e assenta-se a paleta para baixo com o ferro (o lado com a entretela por dentro fica virado para fora formando a pala), ao mesmo tempo que também se assentam as restantes margens do bolso para o interior deste (pode usar-se um molde de cartão do bolso para ajudar, por exemplo). O bolso fica assim pronto para ser pespontado na peça. 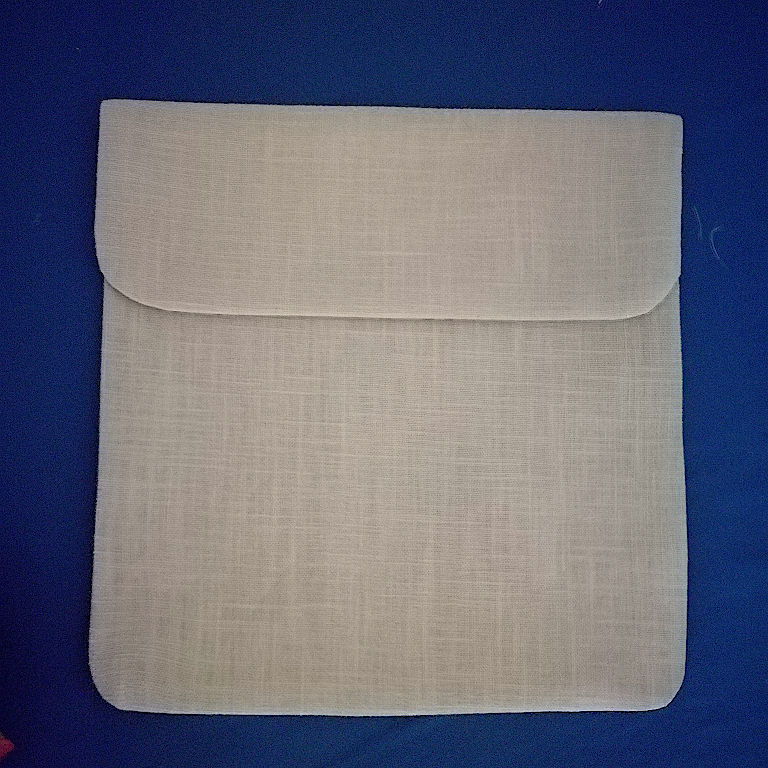 No caso de querermos forrar o bolso (que foi o que eu fiz), temos de cortar uma peça extra de forro que é cosida à parte entretelada. Deixei uma parte da costura de união aberta, para depois poder virar o bolso para o direito, como se pode ver na segunda foto; Dica extra: podem usar o molde de papel do bolso sem margens de costura para coserem com precisão nas curvas. EN: Before top-stitching the pocket down to the coat I top-stitched the edge of the flap. 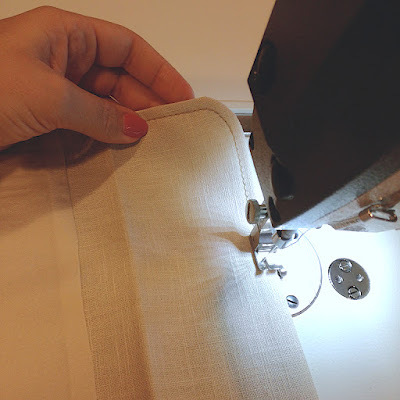 For this I used a 1/4" right side compensating presser foot on my industrial sewing machine, which stitches at 1/4" consistent distance to the left of the edge. I used top-stitching thread on the needle (regular thread on the bobbin), and a size 16 needle; I increased the needle thread tension and also increased the stitch length to 4mm. PT: Antes de pespontar o bolso no casao, fiz um pesponto decorativo na paleta apenas. Para isso usei o calcador compensador esquerdo da minha máquina industrial que permite coser a uma distância constante de 6.4mm da beira. Usei linha torçal na agulha (agulha tamanho 100) e linha normal na bobina; aumentei um pouco a tensão da linha da agulha e também o comprimento do ponto para 4mm. 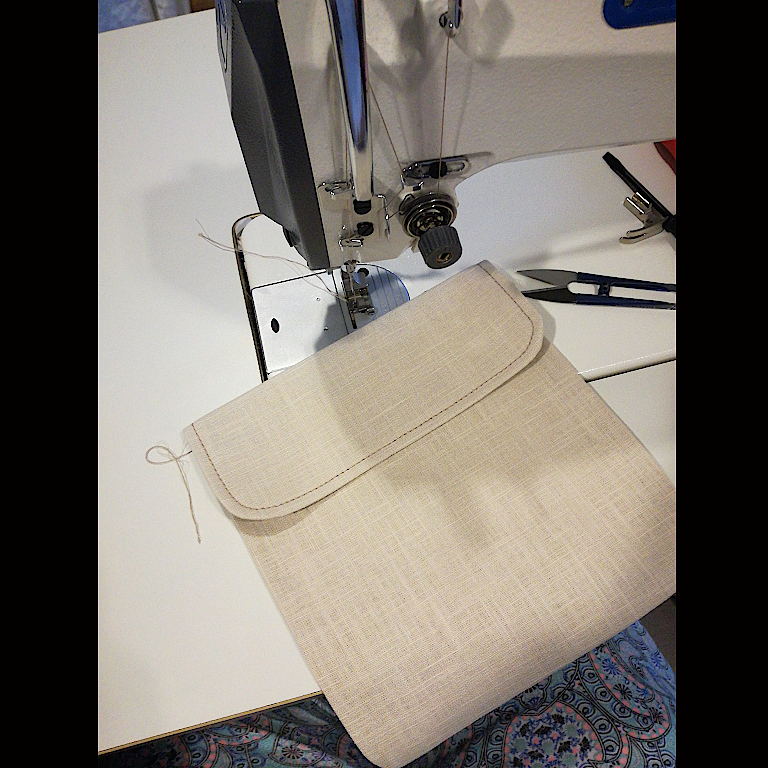 EN: To top-stitch the pocket to the coat I used another compensating presser foot, but this time the 1/16". I used top-stitching thread and kept all the other previous settings. PT: Para pesontar o bolso no casaco usei outro calcador compensador, mas desta vez de 1.6mm. Mantive todo o resto (confifurações e linhas). EN: When trying on the finished coat I noticed that these pockets have the tendency to snag outwards with the weight of the flap. This happens mostly due to the loose-fitting nature of the coat so keep this detail in mind if you plan on making such pockets. I fixed it by installing a little snap inside the pocket opening, which keeps the pocket bag in place. This is all for today, and stay tuned because I will share the details of the finished coat soon! Thank you all for reading! PT: Quando vesti o casaco de detetive pela primeira vez notei que os bolsos tinham a tendência para abrir e descair com o peso da paleta; isto acontece essencialmente porque estão cosidos a uma peça solta e não ajustada ao corpo, e devem ter isso em consideração se quiserem optar por este tipo de bolsos. 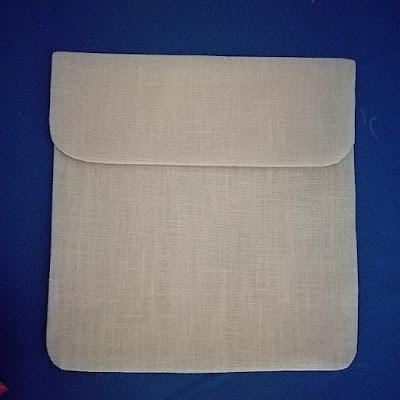 De qualquer maneira resolvi o assunto instalando uma pequena mola de pressão dentro do bolso, na abertura, que impede que o bolso descaia. E é tudo por hoje. Mantenham-se atentos pois muito em breve vou publicar os detalhes do casaco pronto! Obrigada por aparecerem! great explanation, thanks for posting. I don't usually do patch pockets but I like the extra flap detail. Thank you for this excellent article. What beautiful pockets! As with all your sewing your work is exemplary! This is really creative work. I love the fact that I’ve never seen something like that before.